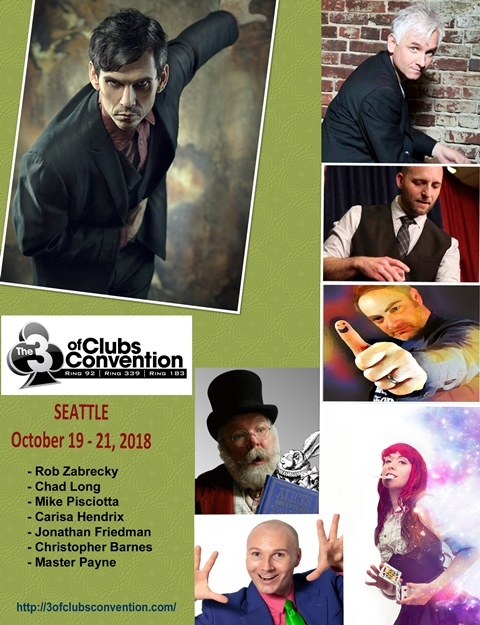 The 3 of Clubs returns for another spectacular weekend of magic! Lectures, shows, vendors, contests, flea market, and GOOD TIMES! We only have 100 spaces for this year’s event, and with this year's line-up we do expect to sell out. Please help out and reserve your hotel room sooner rather than later. Hotel sales keep our costs down considerably, and we counted on that when setting our prices this year. You can stay for both nights, or even just one will help. Please be sure to use our group code to ensure that we get credit for your stay. Just a heads up that tomorrow this will be advertised in the latest edition of Vanish Magazine (Paul Romhany's excellent mag, and by the way... it's free!). We expect this to push us to a sell-out, so if you're on the fence about attending, this is probably a good time to decide. We're keeping the price as low as we can, and have negotiated a good rate at a prime Seattle area hotel. Share a room and it's only about $70+/- per night. 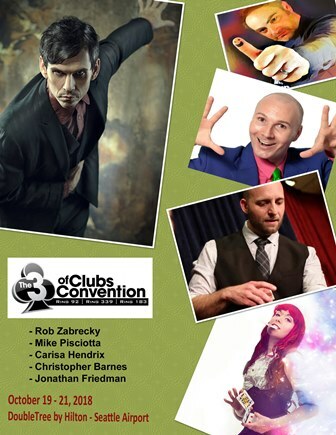 Chad Long has been added to the line-up, and will be lecturing and performing at the 3 of Clubs! The Friday night show will now be The Close-Up Show, emceed by Ring 92 - starring Chad, Jonathan Friedman, and Mike Pisciotta! The Saturday night Gala Show will have Rob Zabrecky, Carisa Hendrix and Christopher Barnes! What a weekend of magic! Check out our growing list of performers! I will be leaving for Hawaii in the 17th or I would be there!! Sorry you can't make it, but how could I not understand? Mekka Lekka Hi Mekka Hiney Ho! The party starts on Friday evening! Still about 10+ admission available. Hotel block is sold out, but you can still probably get a room through the Hilton website.